John Joseph Ambrose Curtin (8 January 1885 – 5 July 1945) was the 14th Prime Minister of Australia, serving from 1941 to 1945, and the Leader of the Labor Party from 1935 to 1945. Having first formed a minority government in 1941, Curtin led Labor to victory (and majority government) at the 1943 election, which remains Labor's greatest victory in a federal election (both in the House of Representatives and the Senate). As the Member for Fremantle, Curtin was the first and to date only prime minister to represent an electorate outside the Eastern states. Curtin was born in Creswick, Victoria in 1885. His father was a police officer of Irish descent, and Curtin was initially raised a Roman Catholic. Curtin attended school until the age of 13, when he left to start working for a newspaper in Creswick. He soon became active in both the Australian Labor Party and the Victorian Socialist Party, which was a Marxist organisation. He wrote for radical and socialist newspapers. 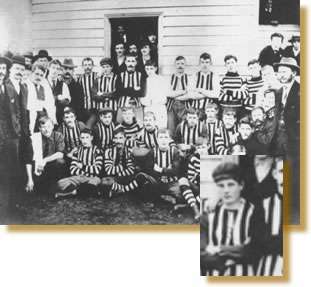 It is believed that Curtin's first bid for elected office came at this time, when he stood for the position of secretary of the Brunswick Football Club and was defeated. He had earlier played for Brunswick between 1903 and 1907. From 1911 until 1915, Curtin was employed as Secretary of the Timberworkers' Union, and during World War I he was a militant anti-conscriptionist; he was briefly imprisoned for refusing to attend a compulsory medical examination, even though he knew he would fail the exam due to his very poor eyesight. He also at this time stood as the Labor candidate for Balaclava in 1914. The strain of this period led him to drink heavily and regularly, a vice which blighted his career for many years. 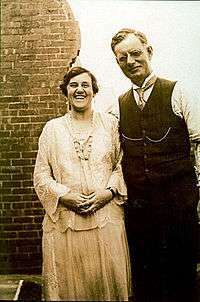 In 1917, he married Elsie Needham, the sister of Labor Senator Ted Needham. Curtin moved to Cottesloe near Perth in 1917 to become an editor for the Westralian Worker, the official trade union newspaper. He enjoyed the less pressured life of Western Australia and his political views gradually moderated. He joined the Australian Journalists' Association in 1917 and was elected Western Australian President in 1920. He wore his AJA badge (WA membership #56) every day he was prime minister. In addition to his stance on labour rights, Curtin was also a strong advocate for the rights of women and children. In 1927, the Federal Government convened a Royal Commission on Child Endowment. Curtin was appointed as a member of that commission. When Scullin resigned as Labor Leader in 1935, Curtin stood in the election to replace him, although he was not expected to win. His opponent was Frank Forde, a well known MP who had been closely associated with the economic policies of the Scullin Government. This led left wing factions and trade unions to support Curtin, in an attempt to block Forde from getting the leadership. With their support, Curtin was able to defeat Forde by just one vote to become Leader of the Labor Party and Leader of the Opposition. The groups that had supported Curtin did so on the basis that he promise to give up alcohol, which he subsequently did. Although Labor made little progress at the 1937 election, by 1939 Labor's position had vastly improved. Curtin led Labor to a five-seat swing in the 1940 election, which resulted in a hung parliament. In that election, Curtin's own seat of Fremantle had been in doubt. United Australia Party challenger Frederick Lee appeared to have won the seat on the second count after most of independent Guildford Clarke's preferences flowed to him, and it was not until the final counting of preferential votes that Curtin knew he had won the seat. In September 1939, the Second World War commenced when Nazi Germany invaded Poland. In line with the king's declaration of war, Prime Minister Robert Menzies declared war on Germany and announced Australia's support for the British war effort. In 1941, Menzies travelled to Britain to discuss Australia's role in the war strategy, and to express concern at the reliability of Singapore's defences. While he was in Britain, Menzies lost the support of his own party and was forced to resign. His resignation revealed the UAP to be bereft of leadership despite having been in power since 1931. The party elected former Prime Minister Billy Hughes as its new leader. However, Hughes was only a month shy of 78, and was widely seen as too old and frail to lead the country in wartime. Although the UAP was the senior partner in the Coalition Government, Hughes was persuaded to stand down as Coalition leader—and hence prime minister—in favour of Arthur Fadden of the Country Party. Curtin had refused Menzies' initial offer to form a wartime "national government", partly because he feared that it would split the Labor Party, although he did agree to join the Advisory War Council. In October 1941, Arthur Coles and Alexander Wilson, the two independent MPs who had been keeping the Coalition in office since 1940 (first under Menzies, then under Fadden), joined forces with Labor in defeating Fadden's budget and bringing the government down. Governor-General Lord Gowrie was reluctant to call an election for a Parliament barely a year old, especially given the international situation. He summoned Coles and Wilson and made them promise that if he named Curtin prime minister, they would support him for the remainder of the Parliament to end the instability in government. The independents agreed, and Curtin was sworn in as Prime Minister of Australia on 7 October, aged 56. On 7 December 1941, the Pacific War broke out when Japan bombed Pearl Harbour. Curtin addressed the nation on the radio, saying, "Men and women of Australia...we are at war with Japan. This is the gravest hour of our history. We Australians have imperishable traditions. We shall maintain them. We shall vindicate them. We shall hold this country and keep it as a citadel for the British-speaking race and as a place where civilisation will persist." On 10 December, HMS Prince of Wales and HMS Repulse were both sunk by Japanese bombers off the Malayan coast. These had been the last major battleships standing between Japan and Australia. 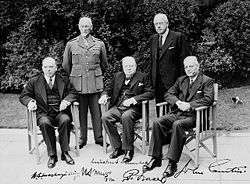 Curtin cabled US President Roosevelt and Winston Churchill on 23 December, saying, "The fall of Singapore would mean the isolation of the Philippines, the fall of the Netherlands East Indies and attempts to smother all other bases. It is in your power to meet the situation...we would gladly accept United States commanders in the Pacific area. Please consider this as a matter of urgency." This historic speech was one of the most important in Australia's history, marking a turning point in Australia's relationship with its founding country, the United Kingdom. Many felt that Prime Minister Curtin was abandoning Australia's traditional ties to the British Isles without any solid partnership in place with the United States. This speech also received criticism at high levels of government in Australia, Britain and the US; it angered Churchill, and Roosevelt said that it "smacked of panic". The speech nevertheless achieved the effect of drawing attention to the possibility that Australia would be invaded by Japan. Before this speech, the Australian response to the war effort had been troubled by attitudes swinging from "she'll be right" to gossip-driven panic. By 1943, when the threat of Japanese invasion had passed, Curtin increasingly returned to a commitment to the British Empire. Downplaying nationalism, he said that Australia comprised "seven million Britishers." He saw the United States as a predatory economic and military power that would threaten Australia's own ambitions in the Pacific. Australia moved closer to New Zealand, and suggested a lesser role for the United States after the war. Washington was annoyed. 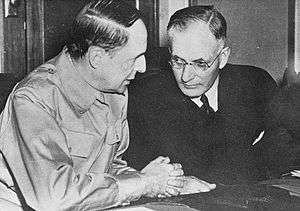 Curtin formed a close working relationship with the Allied Supreme Commander in the South West Pacific Area, General Douglas MacArthur. Curtin realised that Australia would be ignored unless it had a strong voice in Washington, D.C., and he wanted that voice to be MacArthur's. He gave over control of Australian forces to MacArthur, directing Australian commanders to treat MacArthur's orders as if they came from the Australian Government. The Curtin Government had agreed that the Australian Army's I Corps – centred on the 6th and 7th Infantry Divisions – would be transferred from North Africa to the American-British-Dutch-Australian Command, in the Netherlands East Indies. Singapore fell to Japanese control on 15 February 1942, which was regarded as Australia's worst military disaster since Gallipoli. The entire 8th Division was taken into captivity, a total of about 15,384 men, although Major-General Bennett managed to escape. Churchill attempted to divert I Corps to reinforce British troops in Burma, without Australian approval. Curtin insisted that the Corps return to Australia, although he agreed that the main body of the 6th Division could remain to garrison Ceylon. The Japanese threat was further underlined on 19 February, when Japan bombed Darwin, the first of many air raids on northern Australia. By mid-1942, the results of the battles of the Coral Sea, Milne Bay and on the Kokoda Track had averted the perceived threat of invasion. It was at this time that Curtin also expanded the terms of the Defence Act, so that conscripted militia soldiers could be deployed outside of Australia to "such other territories in the South-West Pacific Area as the Governor-General proclaims as being territories associated with the defence of Australia". This was met with opposition from most of Curtin's old colleagues on the left, led by Arthur Calwell. Curtin had previously opposed conscription during World War I, and again in 1939 when it was introduced by the Menzies Government, but relented in the pressure of the Second World War. In terms of social policy, the Curtin Government enacted a wide range of progressive social reforms during its time in office. Pensions were introduced for deserted wives and widows, while the establishment of the Women's Employment Board led to increased wages for some women during the war. Aboriginal Australians were provided with significantly increased entitlement to welfare benefits, while maternity allowances were extended. In addition, pensions for the elderly and infirm were increased, while reciprocal arrangements with New Zealand were introduced regarding old age and invalid pensions. In 1942, temporary public employees became eligible to apply to join the Commonwealth superannuation scheme if they had been employed for no less than five years and were certified as having indefinite future employment, while the Commonwealth Employees' Furlough Act of 1943 provided long service leave for all temporary Commonwealth employees. In 1943, the Universities Commission was established to exempt students from war service to undertake or continue university studies and to assist those students by exempting them from fees and, subject to a means test, by providing them with living allowances. In 1941, all "Asiatics" who were British subjects became eligible for a pension, and in 1942, pension eligibility was extended to Pacific Islanders known as "Kanakas", and from that July that year "Aboriginal natives" of Australia became eligible for pensions if they were not subject to a state law "relating to the control of Aboriginal natives" or if they lived in a state where they could not be exempt from such laws but were of eligible for pension on the grounds of "character, standard of intelligence and development". That same year, pension became exempt from income tax. In 1943, funeral benefits were introduced, together with a Wife's Allowance for wives of incapacitated age pensioners "where she lived with him, was his legal wife and did not receive a pension in her own right." From June 1942, Widows' Pension Class B was paid to widows without dependent children who were aged 50 and over. The term "widow" included de facto widows who had lived with the deceased spouse for at least three years prior to his death and had been maintained by him. Eligibility was also extended to deserted de jure wives who had been deserted for at least six months, divorced women who had not remarried and women whose husbands were in hospitals for those considered to be insane. From July that year, Widows' Pension Class B (WPb) was exempted from income tax. In 1943, Child's Allowance was introduced, payable at the rate of five shillings per week for a first for an unendowed child under 16 years dependent on an invalid or permanently incapacitated old-age pensioner. From July 1945 onwards, Additional Benefit for Children of five shillings per week became payable in respect of the first child to any person qualified to receive unemployment or sickness benefit having the custody, care and control of one or more children under the age of 16. Even allowing for the advantages that an incumbent government has in wartime, Curtin went into the 1943 election in a very strong position. The Coalition had become almost moribund by this time, and Fadden and Hughes had been unable to get the better of Curtin. In the election, Curtin led Labor to its greatest-ever victory, winning two-thirds of the seats in the House of Representatives on a two-party preferred vote of 58.2% and a 17-seat swing. The Coalition was reduced to only 19 seats nationwide, including only seven for Fadden's Country Party. Labor also won the primary vote in all states in the Senate, and thus all 19 seats, to hold a majority of 22 out of 36 seats. Buoyed by this success, Curtin called a referendum which would give the government control of the economy and resources for five years after the war was over. The 1944 Australian Referendum contained one referendum question: "Do you approve of the proposed law for the alteration of the Constitution entitled 'Constitution Alteration (Post-War Reconstruction and Democratic Rights) 1944'?" Constitution Alteration (Post-War Reconstruction and Democratic Rights) 1944 was known as the 14 powers, or 14 points referendum. It sought to give the government power, over a period of five years, to legislate on monopolies, corporations, trusts, national health, family allowances, freedom of speech, religion, ex-servicemen rehabilitation, the ability to legislate for Indigenous Australians, and safeguards against the abuse of legislative power. The referendum was defeated, receiving a majority only in Western Australia and South Australia. Nationally overall, 54 percent voted against the question in the referendum. Governor-General The Earl Gowrie signing the declaration of War against Japan, with Curtin looking on. 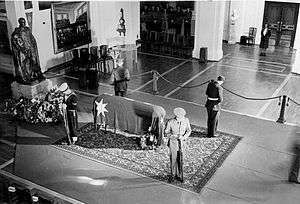 On 5 July 1945, Curtin died at The Lodge at the age of 60. He was the second Australian prime minister to die in office within six years. A Catholic priest called at The Lodge as Curtin lay dying, but he was turned away. Curtin had refused to so much as set foot inside a Catholic church throughout his adult life, not even to attend the weddings of friends. His body was returned to Perth on a RAAF Dakota escorted by a flight of nine fighter aircraft. After lying in state, he was buried at Karrakatta Cemetery in Perth; the service was attended by over 30,000 at the cemetery with many more lining the streets. MacArthur said of Curtin that "the preservation of Australia from invasion will be his immemorial monument". 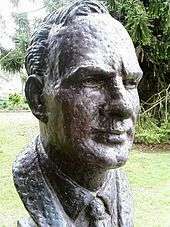 He was initially succeeded as prime minister by his deputy, Frank Forde; eight days later a party ballot installed Ben Chifley as Labor Leader and therefore prime minister. ↑ "John Curtin". Australia's Prime Ministers. National Archives of Australia. Retrieved 29 June 2010. ↑ MacArthur, General Douglas (1964). Reminiscences. London: Heinemann. p. 258. 1 2 "Curtin WA's First Prime Minister.". The Daily News (Home ed.). Perth: National Library of Australia. 5 July 1945. p. 14. Retrieved 19 August 2014. ↑ Serle, Geoffrey. 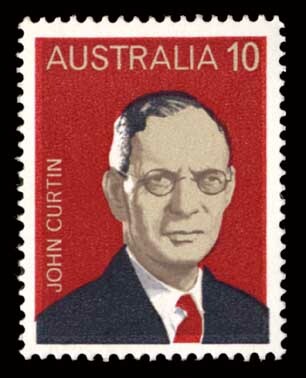 "Curtin, John (1885–1945)". Australian Dictionary of Biography. ↑ "Labor Women". Westralian Worker. Perth: National Library of Australia. 13 July 1945. p. 4. Retrieved 20 August 2014. ↑ "Life in Politics". The West Australian. Perth: National Library of Australia. 6 July 1945. p. 8. Retrieved 20 August 2014. ↑ "Curtin, The Man". The West Australian. Perth: National Library of Australia. 6 July 1945. p. 8. Retrieved 20 August 2014. ↑ "Curtin Speech: Japan Enters Second World War". australianscreen. Retrieved 20 August 2014. ↑ Francis Keble Crowley, ed. (1973). Modern Australia in Documents: 1939–1970. Wren. p. 50. ↑ Edwards, Peter. "Another look at Curtin and MacArthur". 2002 History Conference – Remembering 1942. Australian War Memorial. Retrieved 20 August 2014. ↑ David Day, John Curtin (1999 pp 522–23, 528, 537; quote on page 540. ↑ "Parliamentary Handbook: Constitution – Statute of Westminster Adoption Act 1942". Parliament of Australia. Archived from the original on 20 May 2008. Retrieved 6 May 2008. ↑ "John Curtin, The war at home". Australia's Prime Ministers. National Archives of Australia. Retrieved 29 June 2010. ↑ McMullin, Ross (1991). The light on the hill : the Australian Labor Party, 1891–1991. Oxford University Press. ISBN 978-0-19-554966-9. ↑ "Information Regarding Cornwell-Type Claims". Australian Government – Department of Finance. Retrieved 20 August 2014. ↑ "Labour Viewpoint". The Canberra Times. National Library of Australia. 25 November 1949. p. 3. Retrieved 20 August 2014. 1 2 Whitlam, Gough (1985). The Whitlam government 1972–1975. Viking. ISBN 978-0-670-80287-6. ↑ Daniels, Dale (18 June 2004). "Social Security Payments for the Aged, People with Disabilities and Carers 1909 to 2003 – part 1". Parliament of Australia – Parliamentary Library. Archived from the original on 14 September 2004. Retrieved 20 August 2014. ↑ Daniels, Dale (8 November 2004). "Social Security Payments for the Unemployed, the Sick and those in Special Circumstances, 1942 to 2004". Parliament of Australia – Parliamentary Library. Archived from the original on 13 March 2005. Retrieved 20 August 2014. ↑ Daniels, Dale (15 October 2004). "Maternity Allowance 1912 to 1978, and 1996 to 2004, Maternity Immunisation Allowance from 1998, Maternity Payment from 2004". Parliament of Australia – Parliamentary Library. Archived from the original on 13 March 2005. Retrieved 20 August 2014. ↑ Daniels, Dale (15 October 2004). "Child Endowment 1941 to 1976, Family Allowance 1976 to 1992, Basic Family Payment 1993 to 1995, Family Payment 1996 to 1998, Family Allowance 1998 to 2000 and Family Tax Benefit Part A from 2000". Parliament of Australia – Parliamentary Library. Archived from the original on 13 March 2005. Retrieved 20 August 2014. ↑ Daniels, Dale (15 October 2004). "Child's Allowance/Additional Pension or Benefit for Children 1943 to 1993". Parliament of Australia – Parliamentary Library. Archived from the original on 13 March 2005. Retrieved 20 August 2014. ↑ Crase, Simon (1 May 2008). "Come and see the former heads of the national parliament...or bust!". ABC Ballarat. Retrieved 16 April 2010. ↑ Day, David (11 October 2008). "Buried treasures". The Age. Retrieved 21 August 2014. ↑ "Huge Crowd Pays Homage". The Daily News (Perth, WA : 1882–1950) (City Final ed.). Perth: National Library of Australia. 9 July 1945. p. 8. Retrieved 21 August 2014. ↑ Goot, Murray (1 October 2007). "Three strikes against the polls, or the Govt is out". ABC News. Retrieved 16 April 2010. ↑ Ey, Carol (4 December 2012). "Social security payments for the unemployed, the sick and those in special circumstances, 1942 to 2012: a chronology". Retrieved 21 August 2014. ↑ Grattan, Michelle (5 March 2005). "Curtin's Gift". The Age. Melbourne. 1 2 3 "Social Services and Immigration". John Curtin Prime Ministerial Library. Retrieved 28 November 2013. 1 2 3 Herscovitch, Andrew; Stanton, David (2008). "History of social security in Australia" (PDF). Family Matters. Australian Institute of Family Studies. 80: 51–60. Retrieved 20 August 2014. ↑ Alexander, Fred (1967). Australia since federation : a narrative and critical analysis. Nelson. Retrieved 21 August 2014. ↑ Daniels, Dale (21 February 2011). "Social security payments for the aged, people with disabilities and carers 1901 to 2010". Parliament of Australia – Parliamentary Library. Retrieved 21 August 2014. ↑ "Diary of a Labour Man". John Curtin Prime Ministerial Library. Retrieved 28 November 2013. ↑ "Pension For PM?". The Daily News (First ed.). Perth: National Library of Australia. 7 July 1945. p. 3. Retrieved 21 August 2014. ↑ "John Curtin Prime Ministerial Library". Retrieved 28 November 2013. Black, D. (1995) In His Own Words: John Curtin's Speeches and Writings, Paradigm Books, Curtin University, Perth.